Ruminating on words of piety. On the thirtieth James was slaughtered with a murderous knife. 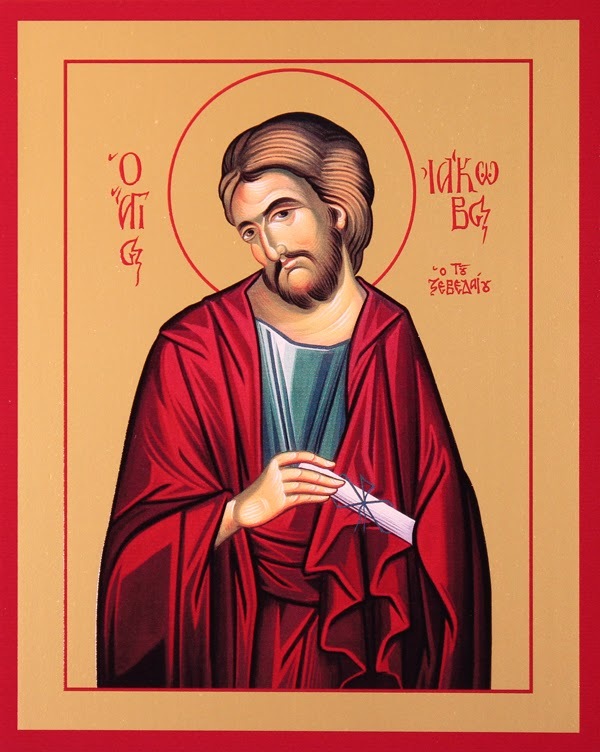 The holy James, the son of Zebedee and brother of the holy Evangelist John the Theologian, was one of the twelve apostles chosen by the Lord from among the simple fishermen, to be His disciple. Called by Jesus Christ, James, together with his brother, left his boat, his father and their fishing nets, and cleaved unto Christ [Mt. 4:21-22], following Him everywhere, listening to His preaching and seeing the miracles He worked. And the Lord so loved both brethren that He permitted one (John) to recline upon his breast [Jn. 13:23], and promised to give the other (James) the same cup to drink which He Himself had to drink [Mt. 20:22-23]. And these apostles so loved their Lord and showed Him such loyalty, that they wanted to call down fire from heaven upon the unbelievers, to destroy them [Lk. 9:54], and would have done so, had not our merciful Lord Jesus Christ Himself forbidden them. To these two apostles, James and John, the sons of Zebedee, as well as to the Apostle Peter, did the Lord principally reveal His divine character and His mysteries in preference to all the other apostles, as happened, for example, on Mount Tabor, when the Lord, desiring to show forth the glory of His divinity, took Peter, James and John, and was transfigured before them [Mt. 17:1 ff]. Saints Jason and Sosipater belong to the chorus of the Seventy Apostles and were disciples of the Apostle Paul. Jason came from either Tarsus or Thessaloniki, according to an old manuscript as noted by Saint Nikodemos the Hagiorite, while Sosipater was from Achaia. They became Bishops: Jason of Tarsus and Sosipater of Iconium. After pastoring their Churches in a God-pleasing manner, they were led by the Holy Spirit to Kerkyra, where they built a sacred church in honor of the Protomartyr Stephen. There they served the Divine Liturgy and preached daily the divine word, attracting many to the true faith. 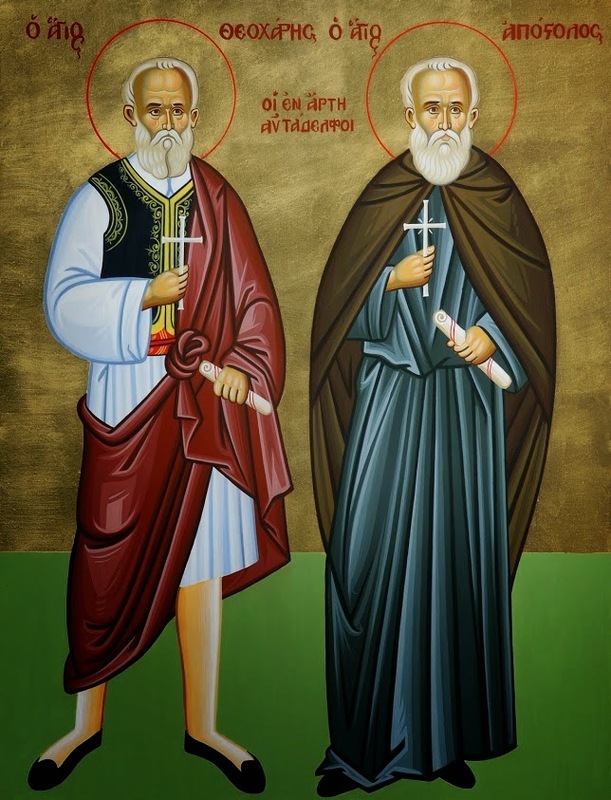 The spiritual work done by these two Apostles with selfless love and divine zeal annoyed the devil and his cohorts, which resulted in them being arrested by the pagan king Kerkyllinos and imprisoned. Even in prison the two Apostles did not cease preaching the Gospel, and they managed to attract seven famous bandits of Kerkyra to the faith, together with the prison guard Anthony, and even the daughter of King Kerkyllinos who was named Kerkyra. The fact that Kerkyra became a Christian made a big impression on the people, thus increasing significantly the number of believers. Kerkyllinos tried to dissuade his daughter Kerkyra, but when this proved to be impossible she was imprisoned and ordered to be corrupted by an Ethiopian. But once the Ethiopian was near the door of the prison, he was attacked by a beast. Saint Kerkyra attended his wounds and taught him the true faith. After the death of Kerkyllinos, his successor Datianos brought Saint Sosipater to be tortured and burned alive. 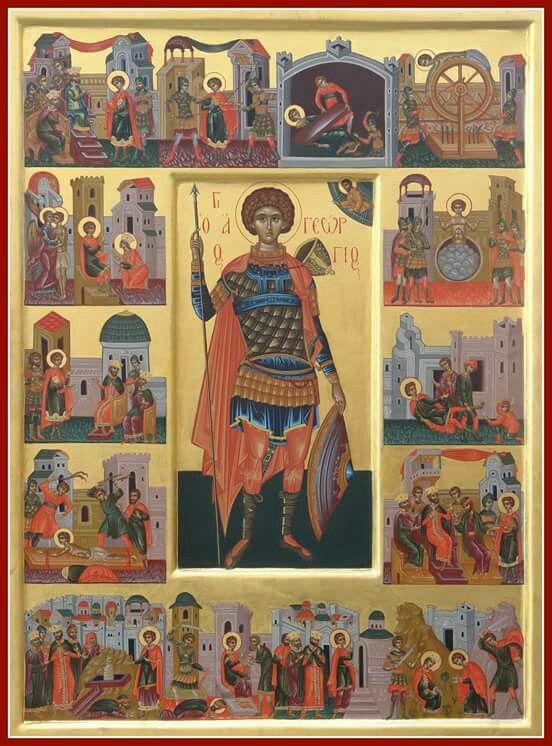 Then, however, Saint Jason managed by his zeal and the Grace of God to lead Datianos to the true faith together with his entire family. After this shocking event, the spiritual work of Kerkyra began to take root deeply and to grow. 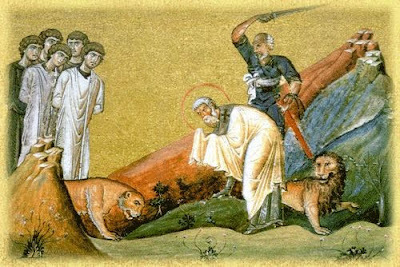 Saint Jason completed his life in deep old age. Saint Sosipater is also celebrated on November 10th. Are the severed heads of the nine men. On the twenty-eighth the nine were carried off from this mournful life. 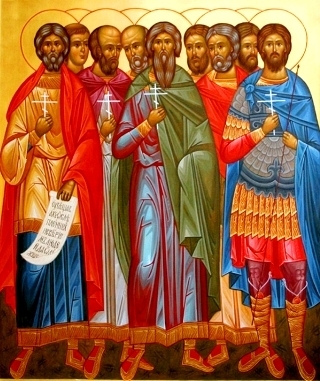 The Nine Martyrs of Kyzikos (Cyzicus) were a group of nine martyrs who in the last decades of the third century were martyred in the city of Kyzikos in Asia Minor for upholding their faith in Jesus Christ. They included Thaumasios, Theognes, Roufos, Antipatros, Theostichos, Artemas, Magnos, Theodotos, and Philemon. The Nine Martyrs are commemorated on April 29. While the city of Kyzikos on the coast of the Dardenelles (Hellespont) in Asia Minor had seen the spread of Christianity from the time of St. Paul's preaching, by the end of the third century Kyzikos was still basically a pagan city. During persecutions, some of the Christians fled the city, while others quietly in secret kept their faith in Christ. The situation distressed the Christians in the city who sought to uphold actively the Christian faith. Through these years as the third century ended there were among these Christians nine men: Thaumasios, Theognes, Roufos, Antipatros, Theostichos, Artemas, Magnos, Theodotos, and Philemon. 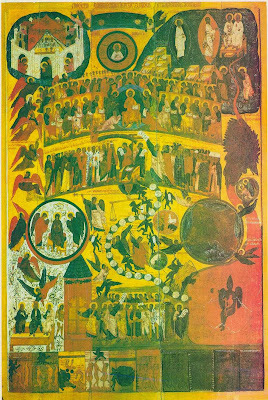 Russian icon of the Judgement depicting the toll-houses. This narration is included in the Synaxarion to be read by the faithful on April 28th. Judged, and from this you became distanced. During the reign of Emperor Heraclius (610-641), when the Exarch of Africa was the patrician Niketas, a strange miracle took place there. In Carthage there lived a man named Tounezi who was a soldier, and when the city fell under an epidemic, he departed with his spouse. They went to their home in the country, where they resided so as not to become ill. But the envious and murderous devil lured this man into sin and led him to commit adultery with the wife of his farmer, who cultivated the land. He then fell ill with a hernia and died. 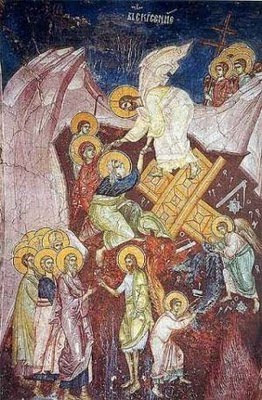 Three hours after being buried, however, he began to shout from his grave, saying: "Have mercy on me, have mercy on me!" Having opened the grave, they found him alive, yet he was unable to speak. The Patriarch of Alexandria, Thalassios, strengthened him with words of comfort. 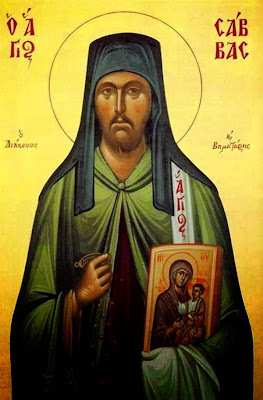 Saint Symeon was one of the four sons of Joseph, the betrothed of the Most Holy Theotokos, which he acquired from his first wife. The other three were James the first hierarch of Jerusalem, Joses and Judas. He was also called Simon, which is a diminutive of the name Symeon, just like the Apostle Peter in the beginning of his Catholic Epistle is called Symeon (Acts 15:14; 2 Peter 1:1). He became the second Bishop of Jerusalem after his brother James. He pastored his flock in a manner pleasing to God for more than twenty years, with much toil and sweat, and he led many Greeks and Jews who were in error to the knowledge of God. Having suffered much for the faith, he was perfected by martyrdom. He was crucified like his brother yet Lord and Teacher Jesus Christ in 98 A.D., at the age of one hundred and twenty years. In his iambic verses we read the following: "As a brother of the Lord, Symeon, you suffered, as a brother of the Lord you hung on the wood." The Gospels and the tradition of the Church are pretty clear that two women first saw the risen Lord. We know one was Mary Magdalene who is exclusively spoken of in the Gospel of John, and the other we know was another Mary, but the identity of this Mary initially is not told. The tradition of the Fathers is clear that this Mary was the mother of Jesus, the Theotokos. One way we know this is from the iconographic tradition of the Church, where two women are depicted together as being first witnesses of the risen Jesus. The woman in red (or sometimes blue), the traditional cloak color for the Theotokos, is the Virgin Mary, who is also sometimes depicted with her name engraved near her halo. This depiction goes back centuries, the earliest of which that we know of comes from a miniature of the Crucifixion and the Resurrection in the Rabbula Codex (Syria and Palestine, dated 586-587 A.D.). 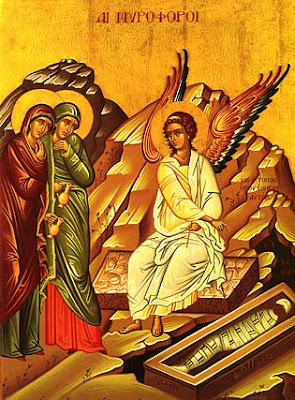 The first scene shows two women at the tomb and the second scene shows them at the feet of Christ. One of the women has a halo, which indicates that she is the Virgin Mary, just as she is depicted in the Crucifixion scene. 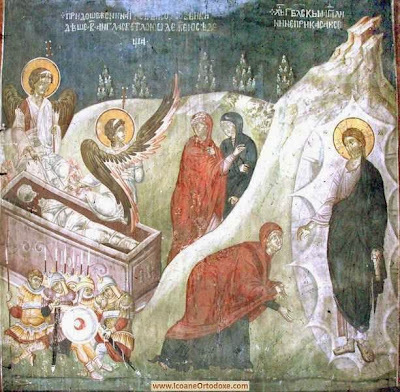 These scenes became the standard iconography for the Sunday of the Holy Myrrhbearers during the Paschal season, and even flourished in the Middle Ages of the West as well. In every age God brings forth holy people who, though they live in the same times and ways of life as their fellow people, “fight the good fight of faith”, and as spiritual lamps enlighten everyone whom they serve in the name of our Lord. In an era that was difficult for our whole [Greek] nation (the end of the 18th and the beginning of the 19th century), God gave the blessing to our city [Arta] to have two brothers according to the flesh, Sts. 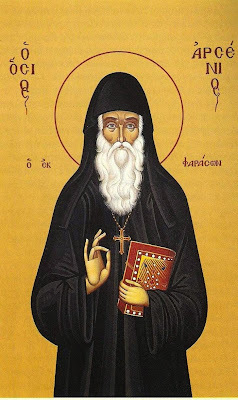 Theocharis and Apostolos, to be born, to live, to struggle in asceticism, to teach and to become holy. 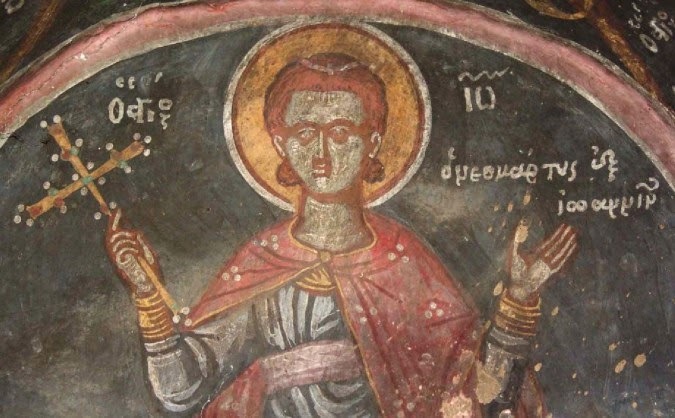 The old icon of Saint George of Symvoulas was found in June 1992 within a cave in the area belonging to a British military base, near the sea, of the deserted "Monastery of Christ of Symvoulas," located near the District of Limassol in Cyprus. The locals honor the icon twice a year on April 23 and November 3. 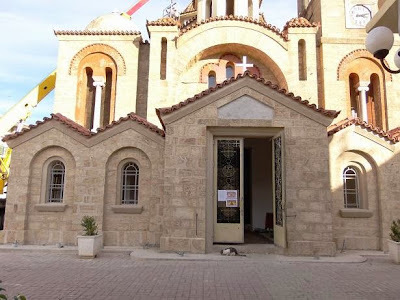 A small church dedicated to St. George the Trophy-bearer is in construction to honor the finding of the icon and has been named the Church of Saint George of Symvoulas. The Saints do not forget, even when people forget about them. The only thing they ask from us is to PRAY, and to have FAITH. Then they perform their miracle. That is exactly what happened in June in the year 1992 somewhere in an area named Symvoulas, which is located in "Happy Valley" Episkopi in a British Military Base, involving the long forgotten Church of Saint George. Sewing for himself a brilliant garment. Doukas was a young and handsome man from Mytilene who had quite a successful trade as a tailor in Constantinople. In fact, he had a rather elite clientele sewing for a number of very high placed Muslim officials. Because of this he frequently visited the houses of his Muslim customers. In one such home, the lady of the house fell in love with him. She made advances towards Doukas who, realizing the danger involved, chose to ignore them. But one day, the Muslim woman visited him in his workshop and said to him, "Young man, listen to me, come to my house as before and don't be afraid. My husband is with the army; he may or may not come back. Now if you wish to deny your faith, I will marry you. If my husband does return, you will still occupy the first place in my palace. But if you do not wish to become a Muslim, stay an Orthodox Christian. Just come and do as I say." However, her final words were, "If you don't come, know you will lose your life." From her birth, Elizabeth was revealed by God to be an elect vessel. In her youth, she undertook to tread the path of ascetic struggles and to dedicate her life as a bride of Christ. At a young age, she entered the Convent of Saint Kosmas and Damian in Constantinople, becoming one of the assembly of pious nuns. The athlete of virtue never wore shoes and donned only one coarse outer garment with large sleeves; thus, she suffered the cold and ice of winter. She never bathed her body with water. Nourished on better hopes, she fasted for forty days, but never partook of oil for years. She disciplined her body and soul in this manner with a view to spiritual regeneration. For three years, fastening her mind only upon God, she never beheld the beauty and breadth of the sky. Immeasurably cheered by the promises of the Bridegroom, she scorned everything else as useless. Saint Sava was born into an old Serbian family from Hertzegovina who took refuge near Arad in Transylvania at the end of the sixteenth century. He was born at Inau around 1620, and received the name Symeon in Baptism. His parents were named John and Maria. At first he was tutored at home, then he traveled in Hungary, Serbia and Bulgaria. After visiting his uncle, Metropolitan Longinus, at the Comana Monastery south of Bucharest, he decided to stay there to complete his education. The Metropolitan tutored him in religious and secular subjects. After completing his studies, Symeon returned home and got married at the age of thirty. He was ordained to the holy priesthood, but his wife died soon after this. Not long afterward, his mother became a nun. 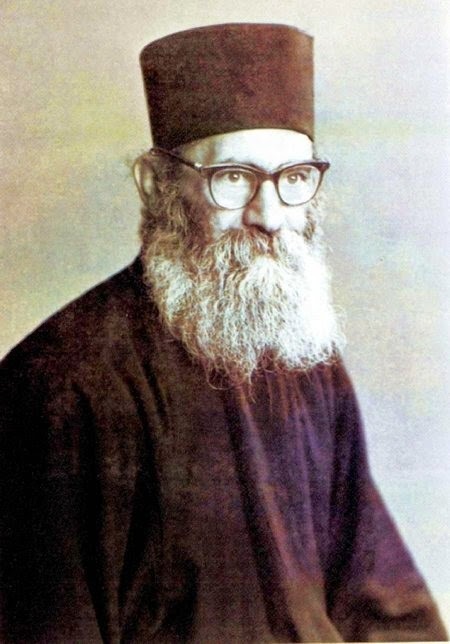 Fr Symeon continued to serve in the Lord’s vineyard for ten years, converting many Muslims, and reconverting Christians who had embraced Islam. 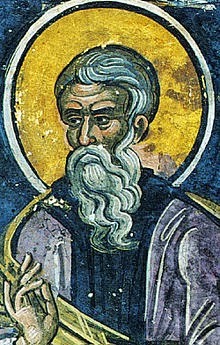 Saint Arsenios was born around 1840 in Farasa of Cappadocia. 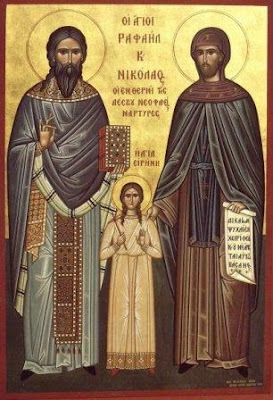 His virtuous parents, Eleutherios and Barbara, had two sons, Vlasios and Theodoros (St. Arsenios), who were left orphans at an early age, and were thus raised by their mother's sister. The well-known story of St. George killing the dragon is obviously a legend and not a fact of history, since dragons do not exist, unless we are speaking of the Komodo dragon, but it is unlikely the Komodo dragon would appear in the Middle East from Indonesia and pose the threat described in the tale. 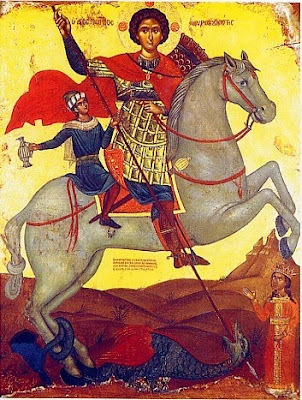 The depiction in iconography of St. George as a dragonslayer is purely symbolic art, and this story is nowhere to be found in the rich hymnography of the Orthodox Church, which references the most realistic elements of the lives of the saints. For example, often in iconography we see St. John the Baptist depicted with wings, but this illustration is purely symbolic of him being an earthly angel and divine messenger. Another example is the depiction of halos around the heads of the saints, which is symbolic of their heavenly citizenship and the Divine Light of their deification and their being filled with the grace of the Holy Spirit. Saint George was the patron saint and protector of several of the great builders of the Russian state. 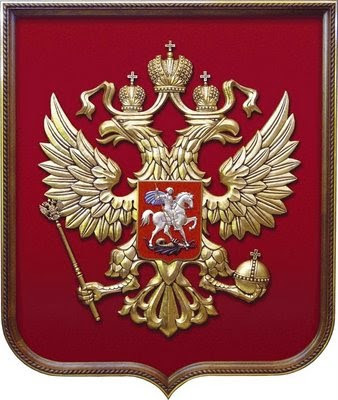 Saint Vladimir’s son, Yaroslav the Wise (in holy Baptism George), advanced the veneration of the Saint in the Russian Church. He built the city of Yuriev [i.e., “of Yurii.” “Yurii” is the diminutive of “George”, as “Ivan” is of “John”]. He also founded the Yuriev Monastery at Novgorod, and he built the Church of Saint George the Trophy-Bearer at Kiev. When Saint George was locked up in prison, the fame of his miracles had reached across the city and its surroundings. Many people filled the prison every night, giving large gifts to the guards to see the Saint and to receive the spirit of strength, the spirit of joy, the spirit of faith and of love. Among them was the poor Glykerios. He only had one ox, which died while plowing his field. He thus fell on his knees before Saint George and begged him to help him. Upon his sincere confession that he believed in God, the Saint received him and told him that his ox was alive. When Glykerios confirmed this, he returned to the Saint to thank him, and he cried out: "Great is the God of George!" For this reason he was arrested and subjected to death by the sword. "If ye were of the world, the world would love his own: but because ye are not of the world, but I have chosen you out of the world, therefore the world hateth you… If they have persecuted me, they will also persecute you; if they have kept My word, they will keep yours also" (John 15:19-20). 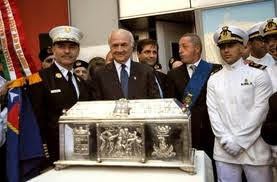 In Greece it was reported today, 22 April 2015, that in the seaside town of Livanites of Fthiotis a possible divine revelation led to the discovery of a skeleton that many are calling a miracle. The story begins three years ago, when a woman from a well-known family of Livanites saw in her sleep a male figure who was speaking with her, but recently asked her to go to a specific location near the Chapel of Saint George of the Foustanella and "dig" to uncover his buried body, and upon doing so she was to bring his remains to the Chapel of Saint George of the Foustanella. 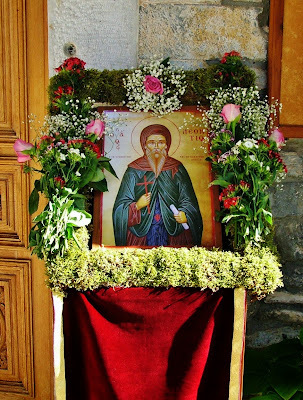 Saint Theodore the Sykeote was born in the mid-sixth century in the village of Sykeon, not far from the city of Anastasiopolis (in Galatia, Asia Minor). The public highway of the imperial post ran through this village, and on the road stood an inn kept by a very beautiful girl, Maria, and her mother, Elpidia, and a sister Despoinia. And these women lived in the inn and followed the profession of courtesans. Theodore was the son of Maria and Kosmas, who had become popular in the Hippodrome in the corps of those who performed acrobatic feats on camels, and was appointed to carry out the Emperor Justinian's orders. When his mother Maria conceived Theodore, she had a vision of a bright star overshadowing her womb. A clairvoyant Elder, whom she consulted, explained that this was the grace of God being poured forth on the infant in her womb. When the boy reached the age of six, his mother presented him with a golden belt, since she intended that her son should become a soldier. 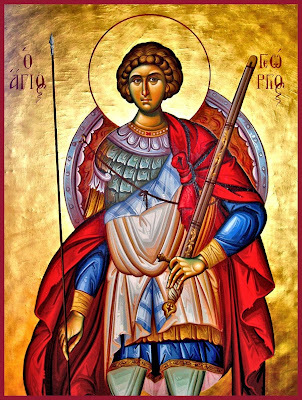 That night the Holy Great Martyr George (April 23) appeared to her in a dream, and he told her not to consider military service for her son, because the boy was destined to serve God. The Saint’s father, Kosmas, had served as a messenger of the emperor Justinian the Great (527-565), and he died at an early age. The boy remained in the care of his mother, and his grandmother Elpidia, his aunt Despoinia and his little sister Vlatta also lived with them. And before your end you saw the God you bear. Our holy father among the saints, Anastasios, lived in the seventh century, and was born of pious parents, likely in Amathos of Cyprus, though he is traditionally said to have been from Alexandria. At an early age he renounced the world and all in it and took up his cross, according to the command of the Lord. He was tonsured a monk and followed Christ with eagerness, pursuing the great struggles that lead toward virtue. After visiting Jerusalem as a pilgrim and venerating the holy places in the Holy Land, he went to Mount Sinai where he found monks that lived an austere life at the Monastery of Saint Katherine, and he stayed with them. 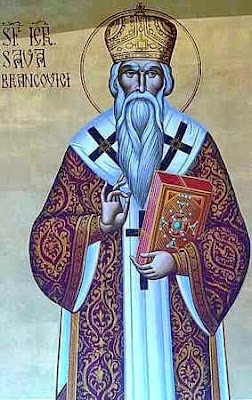 There he served with perfect obedience and extreme humility, on account of which he received gifts from God, such as wisdom and knowledge, which he used to record the many lives of the holy fathers and wrote soul-benefitting works. Having arrived at a ripe old age, he reposed in peace in the early eighth century. 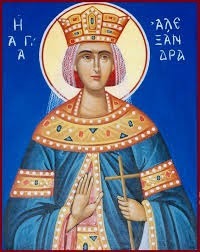 Christ's holy Martyr, Alexandra or Alexandria, was the wife of Emperor Diocletian (r. 284-305). Diocletian hailed from Dalmatia of the Adriatic coast of Yugoslavia. Like many low born Roman boys from the backward provinces, Diocletian pursued a career in the Roman army. When he came to power in 284, he made it his main purpose to stabilize and reform the empire. To this end, he created an absolute monarchy, with all power centering in himself as the semi-divine ruler. He made his palace a divine haven and his own person sacred. The Senate was permanently in a subordinate position. Saint Januarius lived in the third century during the reign of Emperor Diocletian. He was made worthy to become Bishop of Naples in Italy and served the Church with God-given zeal. With boldness he gave his testimony for Christ and sealed it with the blood of martyrdom. 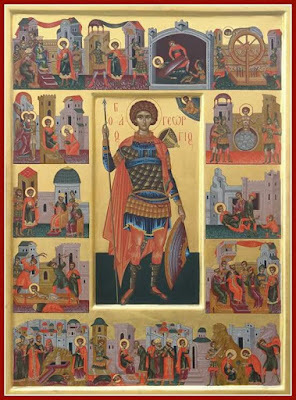 His chosen coworkers followed him to martyrdom: Deacons Proculus, Sossius and Faustus, the Reader Desiderius, and the laymen Eutychius and Acutius, together with many pagans who were present at the martyrdom of the saints and believed in Christ. When Saint Januarius was arrested and led to his martyrdom, then many Christians went out into to the streets to cheer him on. 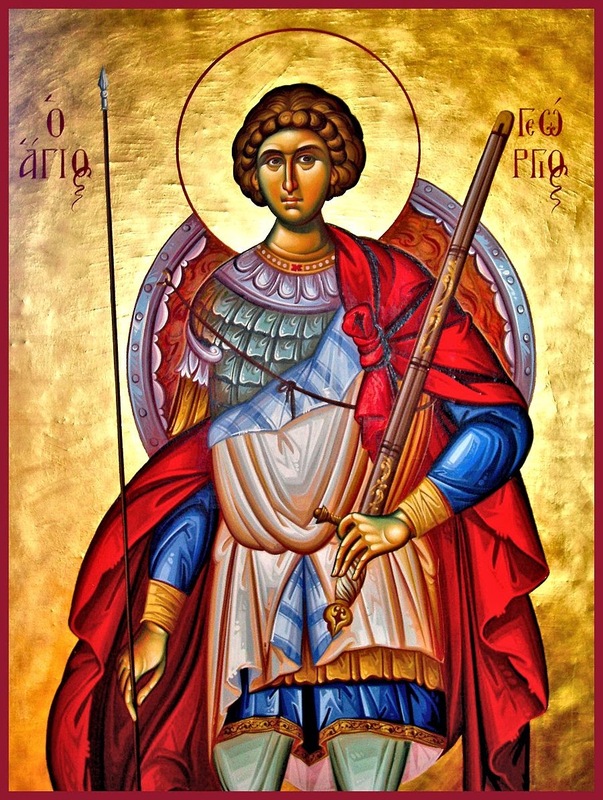 In fact, they tried to grab him from the hands of the soldiers, and certainly there would have been a scuffle between the faithful and the soldiers, if the Saint did not intervene to reassure the faithful and ask them not to hinder him, but to allow him to enter the arena of martyrdom. And to persuade them to retreat he promised them that after his martyrdom he would be constantly near them and protect them. Saint Zacchaeus, as is known from the Gospel reading that is read every year in the sacred churches before the Triodion, is mentioned in the Gospel of Luke (19:1-10), that he was a chief publican and wealthy man who sought to see Christ. When he heard that the Lord was to pass through Jericho he climbed a sycamore tree, because he was of a small body stature, in order to see Him. Christ saw him and said: "Come down quickly, for I must stay at your house tonight." Indeed, He even called him out by name, even though he had never met Him nor seen Him before. Zacchaeus immediately came down and welcomed him with joy, while those present began to grumble and complain because the Lord went to stay in the house of a sinner, as if they were sinless. But Christ went to the house of Zacchaeus first because He visits, without discrimination, all those who want Him and desire to seek Him with faith, and secondly because He saw the heart of the chief publican inflamed with true repentance and the desire for correction. Indeed, Zacchaeus actively showed his repentance, when he publicly proclaimed that he would give half of his property to the poor and those he wronged he would give a return fourfold. For this reason he was made worthy to hear from the mouth of Christ those most sweet words: "Today salvation has come to this house." 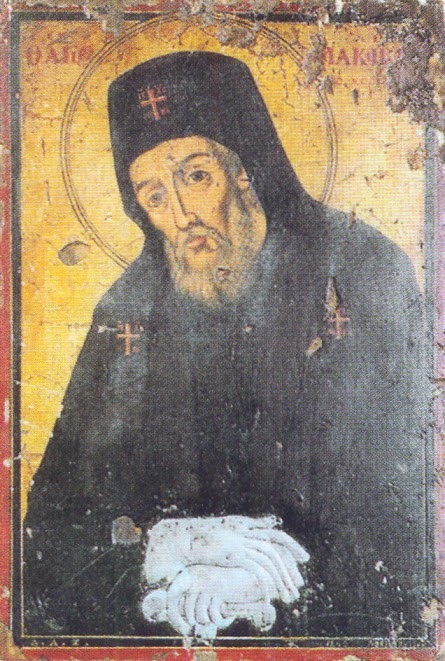 The Neomartyr John was born in Ioannina from pious parents, who raised him "in the education and admonition of the Lord". He practiced the profession of tailor and the income he received from his work he distributed in three equal parts. The first part he gave to his parents, the second he gave in alms, and the third he held for his own livelihood. 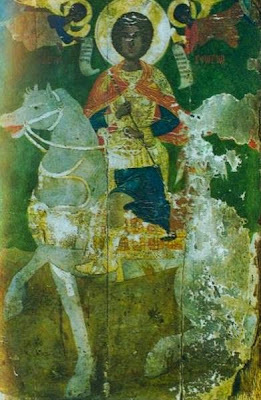 After the repose of his parents he moved to Constantinople, when Patriarch Jeremiah I (1525-1545) was Ecumenical Patriarch, who hailed from Ioannina. 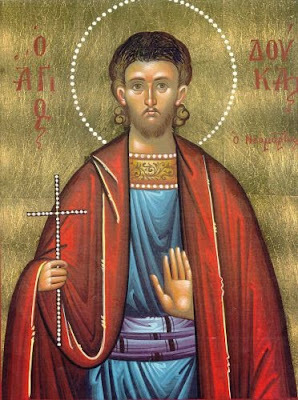 Saint John was a virtuous young man, gifted in body and soul with many gifts which caused the envy of some Turks, who pressed him to deny his faith and become a Muslim. John asked the blessing of his spiritual father to proceed towards martyrdom, because he understood that the time had come for him to give his confession for Christ and to seal it with his blood, but his spiritual father advised him to wait. Eventually, he was convinced it was God's will for John and he gave his blessing. Meanwhile the Turks, who had not ceased for a moment to disturb and pressure him to convert, slandered him saying that once in Trikala he denied Christ. John told them that such a thing never happened, nor will it happen ever in the future. Then they angrily arrested him and dragged him before the judge, before whom he confessed once again his faith in Christ and therefore was tortured fiercely and thrown in prison. Inside the prison, he was full of inner peace, praying and praising God with hymns, and because he continued to remain firm and steadfast in his faith he was condemned to death. Human beings can have two kinds of faith. The first kind of faith, which has its seat in the mind, is the reasonable faith of acceptance. In this case, a person rationally accepts something and believes in what he has accepted, but this faith does not justify him. When Holy Scripture says, “man is saved by faith alone,”1 it does not mean that he is saved merely by the faith of acceptance. There is, however, another kind of faith, the faith of the heart. It is referred to in this way because this kind of faith is not found in the human reason or intellect, but in the region of the heart. This faith of the heart is a gift of God that you will not receive unless God decides to grant it. 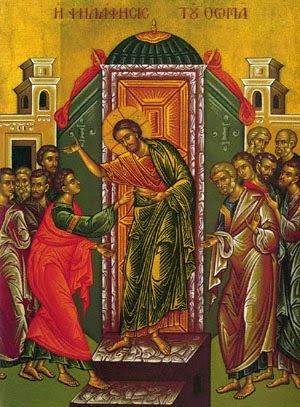 It is also called ‘inner faith,’ which is the kind of faith that the father of the young lunatic in the Gospel asked Christ to give him when he said, “Lord, help my unbelief.”2 Naturally, the father already believed with his reason, but he did not have that deep inner faith that is a gift of God. 1. Today we keep the Feast of New Sunday, or rather we celebrate the inauguration of the New Lord’s Day. So our word today is intended to reveal a little more of the mystery of Sunday to your charity, as far as time allows. If this is a great and exalted mystery, and not even its more accessible aspects are easy for everyone to understand, we must give thanks to the Lord of all Who gave His name to this day, and Who, through His Coming in the flesh, bestowed on those who draw near to Him through faith things which are perhaps a little difficult for our mind and reason to grasp. 2. But heed the sense of my words, all of you. And if anyone is unable to understand everything, he will grasp the full meaning from the little he does understand, since the Holy Spirit’s teaching is a word of light. In Six days God not only made and adorned the whole visible world, He also created and brought to life the only creature with sense and a mind: man (Gen 1:1-27; 2:7). To him He granted dominion over all the animals and plants throughout the world (Gen 1:38). Then on the seventh day God rested from all His works, as we are taught by Moses (Gen 2:2), who was born later, but beheld the foundation of the world long before his time, or rather as the Holy Spirit in His love for mankind sounds in our ears and souls through Moses’ words. “And God”, it says, “blessed the seventh day and sanctified it” (Gen 2:3). Why did He bless and hallow that day on which He did nothing? For he did not bless and hallow the first day as the most highly exalted, which is why it was referred to by Moses as “one” and not as “first” (Gen 1:5 LXX), that day on which God brought forth everything out of nothing all at once, and illuminated it with new light, although He had not yet put it in due order, assigning everything to its place and kind. And if He did not bless and sanctify that first day, why not the following day, on which He established the great firmament, and stretched out around us the first heaven and after it the second? Then again, why did He not bless the day after that, or the ones following, during which the earth was formed by the waters drawing back and took all nature as its adornment, the heavens received the two great lights for eyes, and the birds and sea creatures took their being from the waters by divine command, each after their kind? 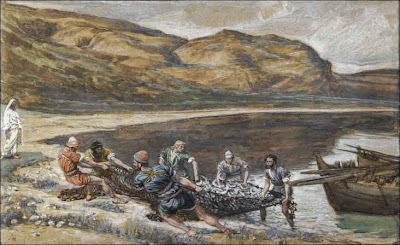 What Do the 153 Fish Caught by the Apostle Peter Signify? "Simon Peter went up and drew the net to the land, full of large fish, a hundred and fifty-three; and though there were so many, the net was not torn" [Jn. 21:11]. What does the number of the one hundred and fifty-three fish in the Gospel signify? The following miracles of St. Makarios were recorded by his friend and fellow resident of Chios St. Athanasios Parios, who was an eye-witness not only to the sanctity of the life of St. Makarios, but also the wonderworking grace of the Saint post mortem. 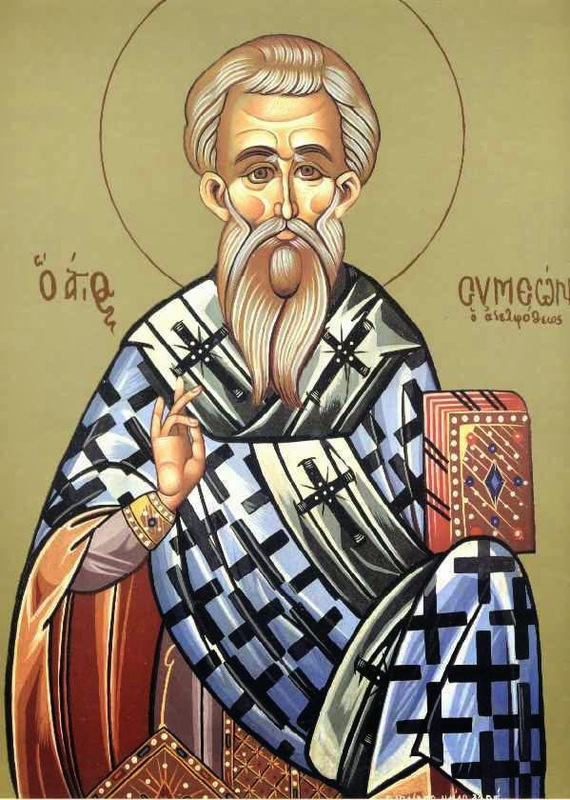 St. Athanasios recorded twelve miracles as an appendix to the life he wrote of the Saint, of which four (nos. 1,3,4, and 8) are presented below. Near the famous Church of the Archangels, which is commonly known as Kambana, there lies one dedicated to the Theotokos and called Marmariotissa. At this parish there lives a woman named Angerou, whose husband, Frangoulis, was originally a Roman Catholic and then espoused our Eastern Faith through Divine Baptism. Now the four-year-old daughter of this couple, Argyri, was assailed by the dreadful and dangerous disease of small pox, and her condition became pitiful and miserable. For four years she suffered continuously from fourteen sores, which the disease caused on her right arm. We saw these with our own eyes, and were horrified. On the road between Paroikia and Naousa on the island of Paros is the male Holy Monastery of the Life-Giving Spring of Longovarda, one of the most important monasteries in 19th and 20th century Greece, especially when the late holy Elder Philotheos Zervakos was its Abbot for many decades until his repose in 1980. 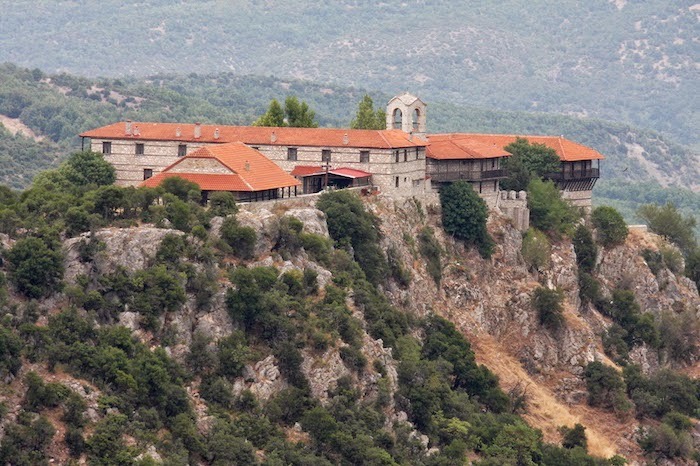 The Monastery was founded in 1638 by the elected official of Naousa, Christopher Palaiologos. In 1652 Longovarda Monastery became Patriarchal and Stavropegic. The Katholikon was built in 1657. It went through some tough trials, so that from between 1800 and 1825 it was deserted and abandoned. 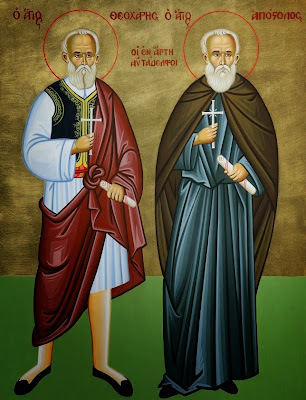 But divine providence presented new founders: Philotheos Georgiou and Hierotheos Ioanou, together with the nephews of the latter named Philotheos and Hierotheos Vosyniotis, who were brothers from Peloponnesos. This period of Longovarda Monastery (1825-1930) is known as its "golden age", when the saintly and wise anchorites from the Holy Monastery of Zoodochos Pege in Poros, Philotheos and Hierotheos, reestablished the Monastery and served as its Abbot. The old historical Holy Monastery of Zoodochos Pege of Poros is located 4km east of the main city of Poros island and is built on the slope of a pine forest. It was founded in 1720 by the Archbishop of Athens Iakovos II who, after suffering from lithiasis, was miraculously cured after drinking from the holy water springing near the Holy Monastery. In 1733 the Patriarch of Constantinople Paisios II recognized it as a Monastery under the Patriarch's jurisdiction. This act gave it a lot of privileges. Later on, in 1798, Patriarch Gregory V, with a sigillion (officially sealed document), which is safely kept in the guest quarters (archondariki) of the Holy Monastery, ratified Patriarch Paisios II's document related to the privileges of the Monastery. In 1814, a group of monks from Mount Athos, called "Kollyvades", took refuge in this Monastery. A few years later, these monks founded the Zoodochos Pege Monastery at Longovarda on the island of Paros. After about 80 years the Holy Monastery of Zavorda of Saint Nikanor seems that it will once again revive its old and religious and historical splendor. It has been reported that 8 hieromonks, until now, have immediately expressed their interest to continue their asceticism in the historic Monastery in Grevena. In this case they will re-establish the avaton, which prohibits females from entering the Monastery. Once again there took place this year, as every year, on Easter Tuesday (04/14/2015), the custom of the icons in the Cave of Grevena, with the presence (for the first time) of the new Metropolitan David of Grevena. 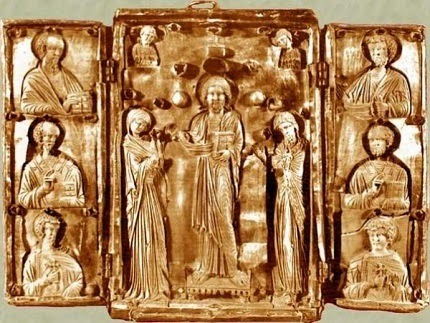 According to this very old custom, in the monastery of the Panagia, there takes place an "auction" of the Honorable Cross and icons from all the churches of the Cave. The Honorable Cross represents the church of the Panagia, and this is followed by icons from the other churches: Saint Athanasios, Saint Michael, Saint Paraskevi and Saint Katherine. - Do you want to find out what kind of love you have? "They who love have long-suffering towards the weaknesses of others. They have kindness. They are not envious. They are not haughty, they do not distort, they do not seek their own interests, they are not irritable. They forget evils done to them. They are saddened when injustice is done to their neighbor, and rejoice in their joy. In all things they are tolerant, trusting, hopeful and patient" (1 Cor. 13:4-7). The Okoni Triptych, a unique and precious 11th century icon, was lost in the 90s but miraculously reappeared at Christie's, the world’s largest art business and a fine arts auction house in 2001. The initial price of the icon was $2 million USD and it was presented at Christie's in Geneva, Switzerland by a Russian citizen. 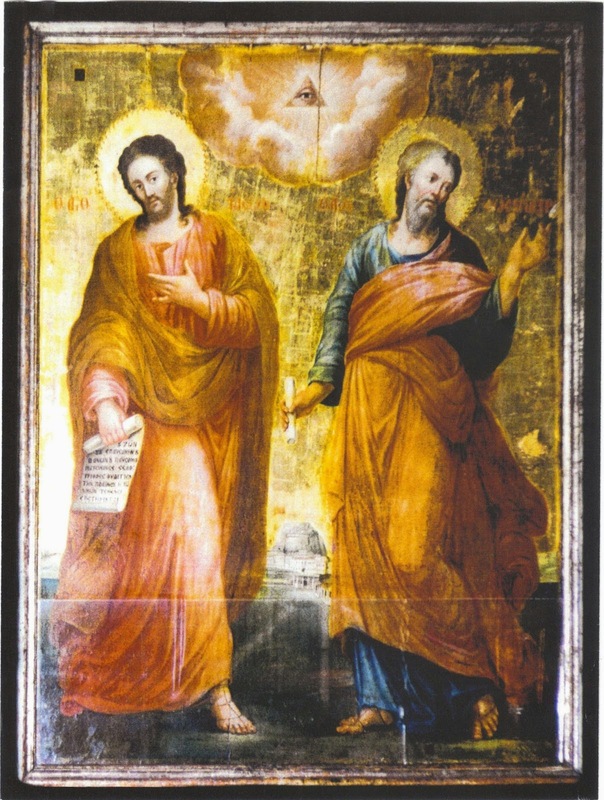 After lengthy negotiations between the Georgian and Swiss governments, Christie's Auction House and the Georgian Orthodox Church, the icon was finally handed to the Georgian side. Michael the Vourliotes worked as a coppersmith in the city of Smyrna (Izmir), though he hailed from the town of Vourla (Urla) in Asia Minor. His Life records that at the age of eighteen he was tricked by a coffee house owner into becoming a Muslim on the First Sunday of Lent in the year 1772. As a Muslim Michael became an employee in a coffee house. One Easter Sunday he heard some young Orthodox Christian men celebrating Easter and singing the Easter Resurrection hymn "Christ Is Risen." This moved him greatly so that his conversion to the Muslim faith began to prick his conscience. The result was that Michael joined the young men and began singing the Resurrection hymn with them. Yet you did not die peacefully, but by the sword. 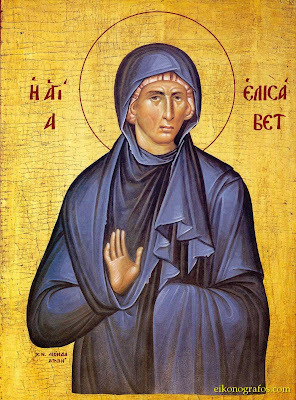 The holy Martyr Irene of Hellas* lived during the reign of Decius (249-251). She was a contemporary of SS. 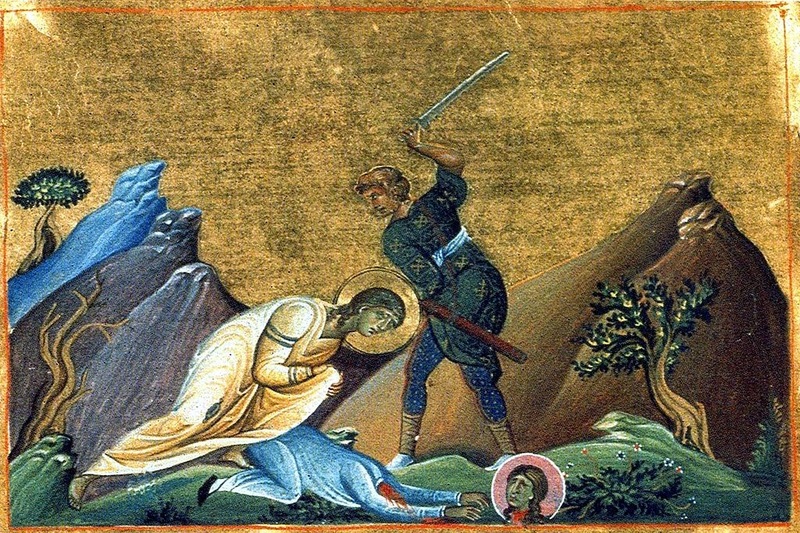 Charissa, Nike, Galina, Kallisa (Kallida), Nounechia, Vasilissa, and Theodora who were martyred with the holy Leonidas at Corinth. It was the Paschal season when Irene was glorifying God with others in their own oratory. The godless magistrate was informed of their congregation. Hence, Irene was arrested and cast into prison. Later, when Irene was removed from her cell, her tongue was cut out and her teeth were uprooted. Finally, the blessed woman, having quaffed a cup of bitter and bloody trials, was beheaded. She then ascended into the heavens bearing her crown of martyrdom. * The name Hellas and Hellenes, by which the Greeks call their country and themselves, originally designated a small district in Ftiotis. In New Testament times, Hellas or Greece was considered the southern portion of Greece, as distinguished from Macedonia [Acts 20:2]. In popular usage, it could also designate the Roman province officially known as Achaia. From The Lives of the Holy Women Martyrs, Holy Apostles Convent, Bueno Vista, CO, 1991, pp. 136-37. 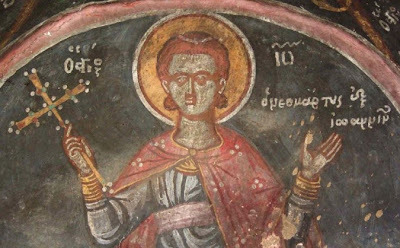 We do not have much information on the life of Saint Leontios. 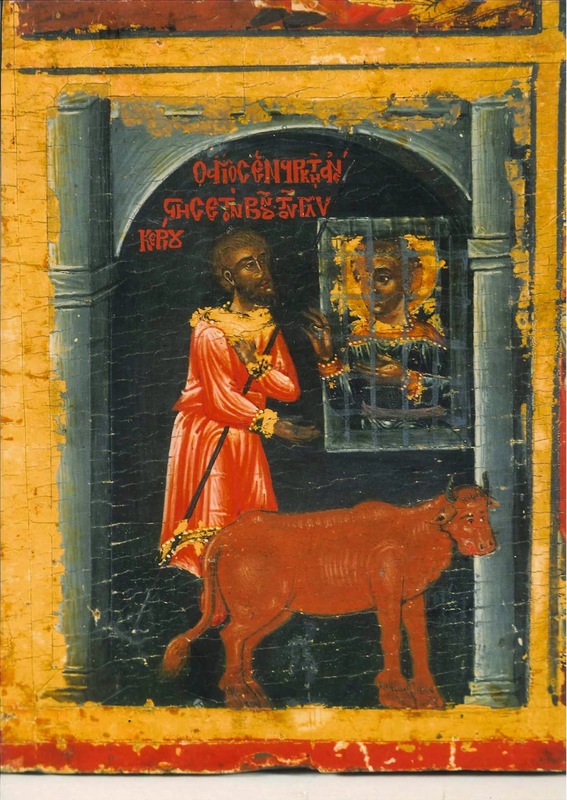 The main sources are the few biographical accounts in the Codex of the Sacred Monastery of the Honorable Forerunner in Gortynia and Codex 163 of the Public Library of the School of Dimitsana. Many other things have been preserved through the oral tradition of the region. Saint Leontios lived before 1770 A.D. (perhaps between 1650 - 1750). He came from the village of Stemnitsa in Gortynia and his surname was Pasomenos. As for his parents, the exact date of his birth, his childhood and his youth, we do not know anything. His monastic tonsuring probably took place in one of the many monasteries that flourished at that time in the area of Stemnitsa. Information about his life becomes more specific when the Saint began his ascetic path to the top of Mount Kastania, which is perhaps the ancient mountain Cnacalus referred to by Pausanias, with an altitude of 1,200 meters, directly opposite the village of Vlacherna. The area of Vlacherna and the caves that adorn the surrounding mountains was a place of asceticism for anchorites. Never and nowhere in any false religion or human philosophy, never has anyone thought, either seriously or jokingly, how it was possible to vanquish the most unwanted intruder into the life of people, our greatest enemy, Death, which is undoubtedly the leading cause of suffering in this present life. The Resurrection of Christ, which abolished Death, will result in the common resurrection of the dead. This is a truth that is purely Christian. It was not devised by the Disciples of Christ, who were primarily simple fishermen, and apparently were not predisposed for philosophies and theories. The victory over death is not a human invention, but a work and revelation of the Holy Glorious Triune God to fallen man. Anastasia and Vasilissa the holy martyrs lived while Emperor Nero reigned (54-68). Hailing from the city of Rome, these wealthy matrons were of noble birth and mind. Both women were converted to Christianity through the teachings of the Apostles Peter and Paul, and became their disciples. Saint Peter was arrested with a multitude of the faithful. Though Nero ordered the others to be decapitated, Peter was to be crucified on the Janiculum Hill. Nero was wroth with Peter for having converted two imperial concubines. Moreover, he held the Apostle responsible for the evil demise of his friend, Simon Magus [Acts 8:9]. 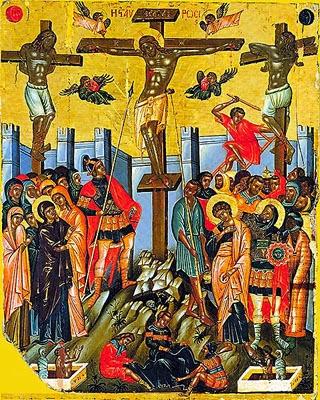 The Apostle Peter requested that he be crucified head-downwards, saying, "I am not worthy to be crucified as my Christ, upright; for thus He was crucified, so as to look to the earth, where He descended into Hades to deliver the souls therein. Crucify me head down, that I may look to heaven, whither I shall go." The holy Peter endured great torment from the nails in his hands and feet, until he surrendered his blameless soul into the hands of God, on the 29th of June, c. 64. Thus, the beloved apostle of Jesus, the holy Peter, reposed, glorifying God in his death by the cross. One of the most astonishing true stories ever told, and certainly of the 20th century, took place on the Greek island of Lesvos in 1959, when Christian Martyrs killed by Turks in 1463 began appearing 500 years later at and near the site of their martyrdom in Karyes near the village of Thermi. Residents of Thermi and nearby villages began to have dreams and visions of these previous unknown Martyrs, particularly of the Abbot of the monastery at Karyes named Raphael, his Deacon Nicholas, and Irene the twelve-year old daughter of the mayor of Thermi who was visiting the monastery with her parents on the day the Turks invaded it. To these residents were revealed the details of the cruel tortures to which they were subjected at the monastery, and they guided them to excavate their relics and the remains of the monastery. St. Raphael especially was calling the people to repentance, giving spiritual counsels and offering consolation, and all three are responsible for the innumerable reports of curing every kind of disease. Metropolitan Iakovos (Kleomvrotos) of Mytilene, who was also a recipient of such revelations and helped reestablish the monastery at Karyes, made four important observations about the events at Thermi in 1963, presented below in its entirety. Around the year 910 A.D. (others say 892) an army of countless Arabs from Syria conquered Crete and Sicily and all the Greek Islands. Some of them came to the Monastery of Vatopaidi, on the eastern coast of the Holy Mountain (Mount Athos), to raid it. 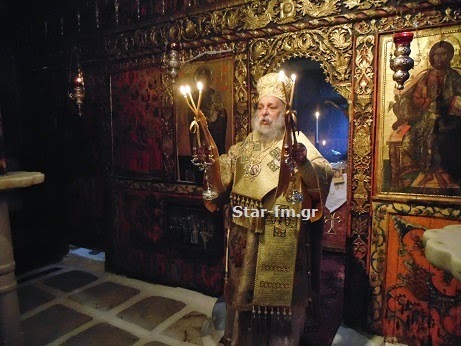 When the Caretaker of the Holy Altar (Vimataris) of the main church (Katholikon), Hierodeacon Savvas, saw them coming, he took the Holy Cross which belonged to Saint Constantine the Great together with the honorable and wonderworking icon of the Panagia Ktitorissa, and hid them in a shallow well under the Holy Altar and lit an oil lamp in front of them. He then skillfully camouflaged the well with stones and branches and ran into the woods to hide. However, the invaders caught up with him, took him and many others prisoners, and sent them to Crete, after looting the Monastery. 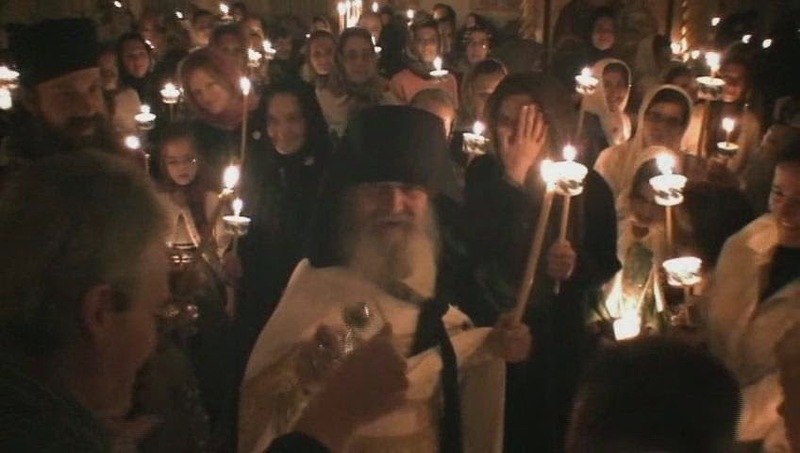 These days the Orthodox clergy and people celebrate the Resurrection of the God-man Christ. 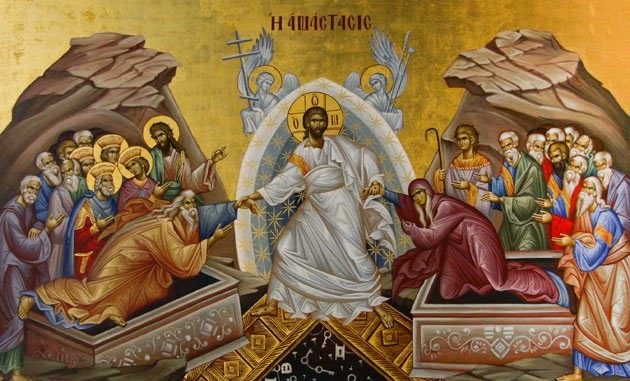 Saint Epiphanios exclaims: "Christ is risen, and is the resurrection of the fallen... Christ is risen, and joy has been bestowed upon all of creation" (PG 43, 465). This event of the Resurrection is the strongest blow against the little faith that is produced by questionings, doubts and frustrations. a) The empty tomb (Jn. 20:6-7). b) The appearances of Christ to His Mother, to the Myrrhbearers, to Mary Magdalene, to the Apostle Peter, to Luke and Cleopa, in the Upper Room, to Doubting Thomas, to the five hundred people outside of His environment (1 Cor. 15), to James the Brother of God, to all of His Disciples on the Mount of Olives, and to the persecutor of Christians Saul who later became the fervent preacher of the Resurrection and the Apostle to the Nations Paul. 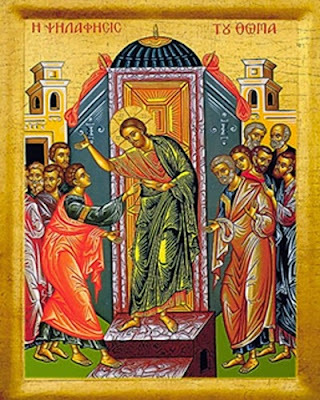 Christ, beloved brethren, heralded His resurrection to His Disciples, when He told them that the Son of Man must "go to Jerusalem and suffer many things at the hands of the elders, the chief priests and the teachers of the law, and that He must be killed and on the third day be raised to life" (Matt. 16:21). The Disciples were unaware as to what it meant that the Son of Man will be killed and will arise after three days from the dead, and moreover "they were afraid to ask" (Mk. 9:31-32). The phrases "Son of God" and "Son of Man" denote the two natures of Christ, the divine and human, which acted together in Christ, without either losing its properties. 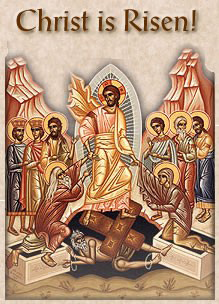 After His resurrection, Christ appeared first to the Myrrhbearing women who went very early in the morning to the tomb in order to anoint His body with spices, and on the same day He appeared to His Disciples. One would have expected Him to appear to those who crucified Him, to the scribes and pharisees and chief priests, to Herod and Pilate and those who contributed towards His passion and crucifixion, and in this way He would cause them to believe. He did not do this, however, because there are special reasons. The Church with its festivities is not content to lead people to psychological respite, but it tries to turn their attention to the core tragic problem that concerns them and, of course, to overcome it. The person of the God-man Christ is always at the center of the festivities, and He is at the center of all history and all humanity, negatively and positively. Indeed, He "is the cause for the fall and rising of many in Israel and a sign to be spoken against" (Lk. 2:34). The Resurrection of Christ especially is a great historical truth, but at the same time it is a great mystery. It is a truth because it took place in a moment of history, "under Pontius Pilate," but it is also a mystery because it is experienced existentially and personally. It is not only an event of an intellectual conception, but an extraordinary experience of overcoming death within the limits of our personal life. Certainly there exist historical testimonies for the Cross and Resurrection of Christ, because Christ was a historical person, but there exist existential testimonies that Christ is the conqueror of death, since God raised up human nature and conquered the greatest enemy that torments humanity - death. 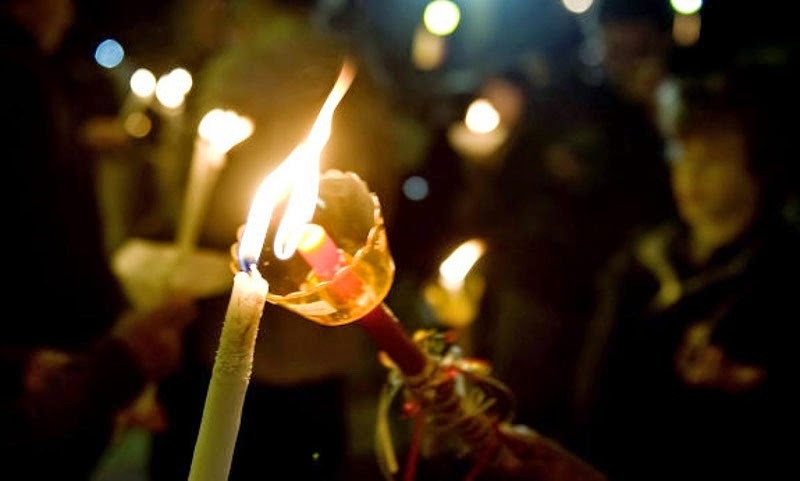 Witnesses of the Resurrection were the Apostles, the Confessors, the Martyrs, the Venerable Ones, the Holy Fathers, men and women who bravely faced their problems in life with hope in the resurrection. It is those who leave this world "with hope in the resurrection to eternal life." All these shed their blood and sacrificed their lives, refusing biological joys and material pleasures. 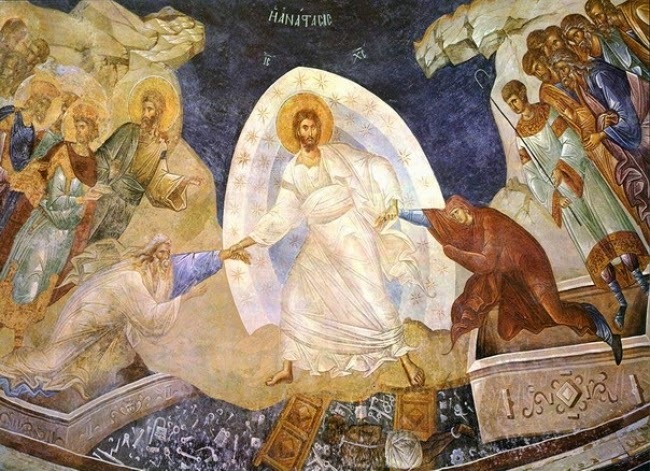 Therefore, the Resurrection of Christ is not an ideology, a worldview, a metaphysic or a mysticism, but it is true life that transforms the entire human existence and overcomes death, mortality and the corruption of nature, and creates a transformation of the person and a renewal of all creation.